In an effort to engage anthropologists working outside academia, the American Anthropological Association’s Committee on Practicing, Applied, and Public Interest Anthropology (CoPAPIA) has embarked on a new initiative to understand the professional peer networks of practicing anthropologists and make recommendations for how the AAA can better support them. The committee is currently conducting firsthand research to explore existing networks as well as the professional networking needs of practitioners, and is reviewing existing AAA survey results related to the topic. I agree this is true, though contrary to what the article says, I do think there are recent grads (including myself) who care as much about the “pragmatics of how to do anthropology” as veteran practitioners do, and that they aren’t just focused on trying to figure out what kind of jobs to get. 2: Networks are important for anthropological identity maintenance. The less a practitioner engages with other anthropologists, the more likely they are to stop identifying as an anthropologist. I agree that there is something to be said about being in the presence of other anthropologists (socially, in the workplace, etc.) that helps maintain interest in and passion for the discipline, one’s anthropological identity, and applying anthropological concepts and methods in one’s work. However, I would like to see the source of information for the idea of a cause-effect relationship between engagement with other anthropologists and self-identification as an anthropologist. I also wonder about the importance for practitioners of identifying as anthropologists with non-anthropologists. In my experience it’s not always an effective way to engage with others in this way if you’re trying to built rapport or convey what it is you actually do. Many practicing anthropologists I know do not identify as such because it’s just not helpful or relevant. 3: There is a need to look beyond traditional networking models to engage practicing anthropologists. In terms of unofficial groups, I have gone to an informal local meet-up of anthropologists at a bar in Portland a couple of times, and have established a few connections as a result. The group is called together by an anthropologist at Intel, Dawn Nafus. Another difference in the LPO versus the informal gathering – the former has no other business/design anthropologists, while the latter has many and is therefore more relevant to my work. My hunch is that the networks and groups we choose to be a part of may also align with our particular areas of practice or research/methodological interests, not just with the discipline as a whole. While I am open to networking with anthropologists in general, much of the work of other people in this discipline, practitioners or not, is just not relevant to me. Traditional conferences (AAA, SfAA) are similar in that they represent all areas of anthropology, not just the one I work in, and it isn’t usually an effective use of my time to attend them (versus a conference on User Experience, for example.) This is not to say they are entirely useless, and I have found value at the SfAAs in the past, but the amount of value is important when the use of time and company or personal funds are involved in the equation. Not surprisingly, the article cites EPIC (Ethnographic Praxis in Industry Conference) as an example of a successful alternative model for networking (though now in its 10th year, it’s definitely no longer an informal organization.) While it is indeed a community leader, it is still a conference, which limits attendees who cannot afford the cost or time away from work to attend. It was also started by (and is attended by a handful of) practitioners who work at Intel, a company with a relatively high number of anthropologists on staff that supports professional development and networking in a way that many other companies don’t. Speaking of conferences, I find it interesting that the article didn’t mention the AAA’s own annual meetings as an example of a networking model that deserves revisiting, as it serves a primarily academic audience and could probably have greater outreach to practitioners. When you are a practitioner, your first priority is your job, not academia or anthropology. What is the point in attending such an event if it lacks enough relevance to practitioners to make it worth the time and money? This likely has an affect on the very networking we are talking about here. 4: Virtual connections are important. The article barely touches on this other than its mention of EPIC and Anthrodesign. There is a ton of networking being facilitated through social media platforms like Twitter and LinkedIn. On Twitter, for example, I observe and participate in dialogue with anthropologists, both academic and practicing, on a regular basis. (Side note: my guess is that there are more practitioners than academics who are active on Twitter because it’s a very non-academic way of communicating.) It’s a place where we carry on dialogues about the topics and issues that interest us, stay abreast of our colleagues’ work, learn about new research, share opinions, and connect with new people in our field. Twitter has been most powerful for me, followed by LinkedIn. In fact, I ended up co-editing an issue of the SfAA journal Practicing Anthropology (2014:36:2) with another business anthropology practitioner (Amy Goldmacher) who I connected with on LinkedIn, but who I have never met in real life. We also took advantage of our online professional networks to solicit the other nine authors for the issue. I am connected to numerous other anthropologists with whom I have interesting, meaningful conversations who I have never met in real life and perhaps never will, or who I met first online and then got the chance to meet “IRL” at a later point. These people have played a major role in my career to different degrees, like making virtual introductions to other anthropologists and potential employers, or sharing my blog posts which makes other anthropologists aware of my work and interested in connecting. LinkedIn is useful because it has numerous anthropology-specific professional groups where people talk about relevant issues, seek advice, and share resources. 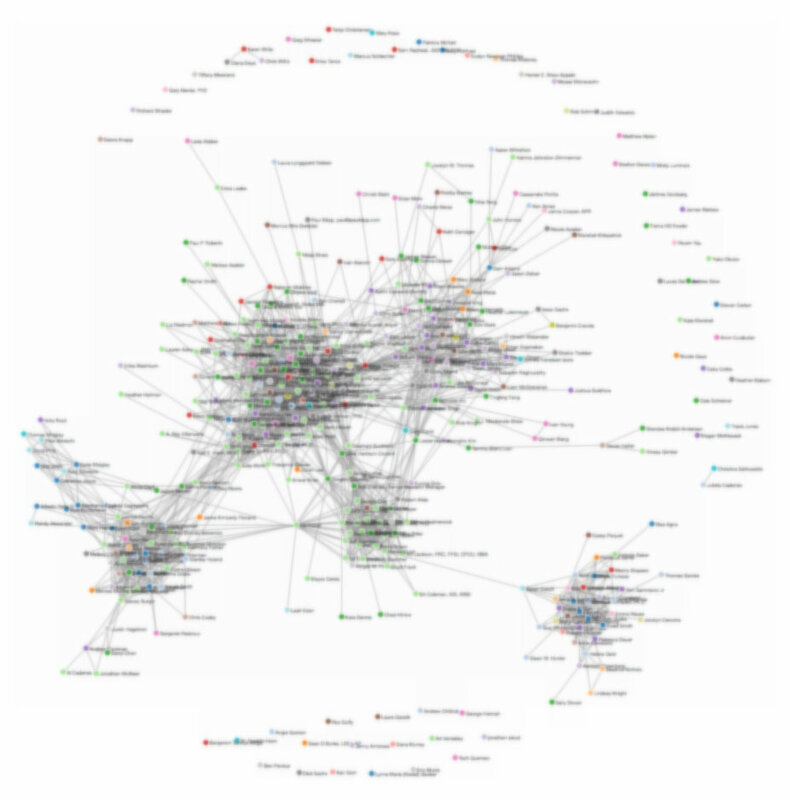 For reference, here is a visualization of my LinkedIn social network of approximately 400 connections (blurred to maintain privacy). The big cluster in the middle signifies the core of my anthropology network, and there are other anthropologists scattered within the other groups. Likewise, blogs are another location for online networking and the exchange of ideas and dialogue, and for becoming aware of/meeting other practitioners. Ethnography Matters and PopAnth a two examples of blogs that are community-based with multiple authors. There are also many blogs written by individuals that play an important role as well (some excellent ones are by Robert Connolly, Gavin Johnston, Grant McCracken, Donna Lanclos, Simon Roberts and Paul Mullins) My regularly updated list of Sites I Like features a number of links to personal blogs by both academic and practicing anthropologists. As I mentioned above, the article calls out Anthrodesign (founded by anthropologist Natalie Hanson) as another place for online networking. This is a great resource for to look into, but it’s important to note that it’s not just for anthropologists. There are probably hundreds of anthropologists who are members (out of about 3,000 total members as of today), but it is actually a group for those who are generally interested in the application of anthropology and ethnography in non-academic settings. This includes designers, product managers, researchers from other disciplines, corporate recruiters, students, and many others who may or may not come from anthropology. Finally, university alumni networks can also serve to maintain ties between departments and practitioners, though they might look different between traditional “academic” departments and those that intentionally produce practitioners. I’m not really familiar with any alumni networks other than that of my graduate alma mater, The University of Memphis, which is beginning to connect students in its proseminar to practitioners, inviting them to give in-person and remote presentations about their work and career paths. While I’m generally interested in the committee’s efforts and think the topic is worth exploring, I have a few thoughts and questions about its nature and purpose based on my observations and experiences as a practicing anthropologist. In the article describing the initiative, the author, Derek Newberry, laments that non-academic anthropologists “remain largely invisible to and disconnected from their peers,” and that their “anthropological networks are often smaller and more sporadic, thus depriving them of a critical source of professional development and engagement.” I’m not sure I totally agree with this assumption about the composition and efficacy of practitioner networks, and I don’t like how it’s being used to frame the goals of this effort. Is this accurate or fair? How does the committee know this? Who did it talk to that led to this conclusion? Rather than describing our networks in terms of deficits, what about just saying that they’re different, or that they’re beneficial in other ways, or acknowledging that how they are comprised might be a result of the realities, priorities and environments of practice? What about making statements about how they lack or compare if some actual research indicates this is true? If the initiative is meant to be exploratory in terms of understanding these networks and whether or not there is a need to support them, rather than about proving or disproving assumptions, it should say so. I would also like to know why is this effort couched only in terms of a practitioner need and as a way to benefit practitioners. While practitioners may benefit from increased connections and support (depending on what that support looks like, of course), academia would benefit tremendously from having a better relationship with the anthropologists who are out in the world applying anthropology and communicating our practical value. Academic anthropologists would gain from establishing connections to practitioners and learning from their experiences and all of the innovation and knowledge they are creating for the discipline. Students also lose out when they have limited access to practitioner perspectives and learn to become anthropologists primarily from academics, because most of them will never be academics. They will also be limited when after graduating they try to build their own networks based on the networks of academics, rather than the networks of non-academics. It would be nice if the article didn’t talk about this effort in such a paternalistic way and entirely in terms of helping out the “invisible…disconnected” people outside the ivory tower. Ultimately, I would like to know what the AAA can offer practitioners that existing services and platforms do not already. To me it’s more a matter of individual anthropologists taking advantage of existing resources in the first place. What could it possibly do to facilitate connections that say, conferences, local events, informal gatherings and the internet, do not? I honestly can’t envision what this support would look like. Let’s say the AAA decides to create some kind of online resource as a solution. Why would someone use it to find anthropologists when they can do that already on Twitter and LinkedIn and through other methods, and probably get more accurate information? How would this resource find out about non-AAA members? And, would you have to be a member of the AAA to take advantage of such a resource or be included in it? Furthermore, what makes networking with other anthropologists more valuable than networking with non-anthropologists? Practitioners are the masters of this because we do it every day in our jobs and professional circles. We know it’s important to connect with others who think differently in order to expand our own perspectives and to collaborate effectively on problem solving. While I’m not saying there is no benefit in the former, I think exploring practitioners’ networking priorities and values is crucial. What is it about the AAA that makes it relevant to practitioners to warrant this effort in the first place, given that it’s an academically focused organization with little practitioner representation? My perception (shared by some of my colleagues) is that the AAA is an organization for anthropologists in academia, not an organization for anthropologists. Maybe that is part of the reason they’re doing this, to become relevant to non-academics. I’m just one person, but here’s how relevant the AAA is to me: It’s not. I have never attended the AAA annual meetings, nor was I a member of the AAA until 2013, when I was temporarily unemployed and could take advantage of the sliding scale membership fees (otherwise the cost was just too high.) I’ve just never seen the point of it, except maybe for having access to anthropology journals (I have actually not used AnthroSource since grad school.) Just recently, I renewed my membership with reluctance because I honestly could not think of a single benefit I gained from it (though it is what allowed me post a comment on the Anthropology News website) and because coincidentally I was again temporarily unemployed. Disciplinary support of anthropology practitioners is something we need more of, but I await the final results/recommendations of this research to understand what exactly that’s going to look like. If it means trying to get practitioners more involved in an institution that exists primarily to serve academia, or providing networking information and connections that are already easily accessible elsewhere, I don’t really see the point. It is encouraging that AAA is reaching out to practicing anthropologists, but I am not especially confident that Newberry’s column captures the rich ways scholars are part of communities outside the narrow confines of AAA. Many of us who might accept being called applied or practicing anthropologists–including those of us in the academy–have a range of networks that reach well outside the conventional conference and professional association. To argue that practicing anthropologists apparently are “invisible to and disconnected from their peers” seems a mis-statement at best; what was implied was that practicing anthropologists are “invisible and disconnected from AAA.” I am not sure that is the fault of practicing anthropologists, and I think AAA needs to more clearly acknowledge that practicing anthropology has as much to give to a richer AAA than they have to give us. I agree that it risks mis-characterizing practicing anthropology networks to devote so little attention to virtual networks or to perhaps unintentionally imply that they are not scholarly in the same way as a 15-minute conference paper, attending a session, or reading American Anthropologist. I’m glad to see some movement in AAA to recognize that many of us inside the academy and tons more of us outside universities could be served by AAA, and Newberry does a nice job starting the discussion, but I would really like to see AAA acknowledge how much practicing work can transform conventional scholarship. Nice piece extending the conversation, I hope AAA will take it seriously.